We’d love your help. 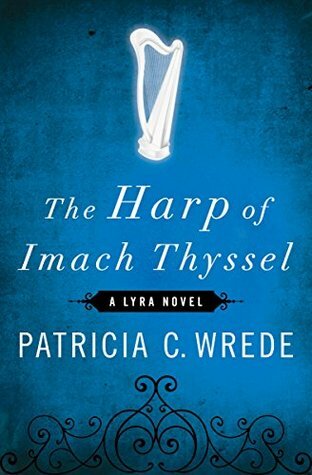 Let us know what’s wrong with this preview of The Harp of Imach Thyssel by Patricia C. Wrede. When Emereck and Flindaran leave a caravan in search of adventure, it isn’t long before they stumble upon great danger. Emereck, a trained minstrel, and Flindaran, a nobleman masquerading as a tramp, have found a long-abandoned castle, and in it, one of Lyra’s most sought-after treasures: the Harp of Imach Thyssel. Emereck recognizes the perfect white bow from legend: It is said to possess the power of life and death over all mankind. Now, to keep it from falling into the wrong hands, he’ll have to learn to harness its strength to create and destroy, with the fate of the kingdom hanging in the balance. To ask other readers questions about The Harp of Imach Thyssel, please sign up. This is part of a series, but it is a stand-alone book. You don't have to read the first two books or the last two books in order to read and follow this one. The only aspect of the book that I found a little tricky without having read the first two books is the world-building. Wrede uses place and race names and refers to some of the events in earlier books through exposition and passing reference. There is no explanation of what or who these places and people are, so you sort of have to accept This is part of a series, but it is a stand-alone book. You don't have to read the first two books or the last two books in order to read and follow this one. The only aspect of the book that I found a little tricky without having read the first two books is the world-building. Wrede uses place and race names and refers to some of the events in earlier books through exposition and passing reference. There is no explanation of what or who these places and people are, so you sort of have to accept that you won't get more detail in this book. Wrede does a good job of not making the other place names too important, but there are some rivalries that are fairly important to the story but that seem based on earlier events or even earlier explanations. Still, none of this impeded my understanding of the events in this book, and sometimes, I like being thrown into a story without having to pace myself with world building first. I chose this book at the used bookstore for the title alone--I enjoy fantasy books about music, and there is something about harps that enthralls me, apparently. I got what I was expecting out of this book, which was a quick, entertaining read that drew me in and kept me reading until the end. The three-star rating I gave it says it all for me. It's not particularly well-written, but it's not poorly written. The characters are okay. They're not well-developed, but they have distinct personalities. The plot is fairly simple and straightforward, but it's suspenseful enough with some surprises thrown in. The Harp had more depth than Wrede's first two books of this series. Interesting interaction among the characters who were more developed than previous players. In fact, it was easy to get caught in a love hate relationship with the stubborn minstrel. This is not the only fantasy I've read where minstrels are given important roles in the medieval settings. They were the newspapers of the day, given most of the population were illiterate. Of course tales retold take on their own personality and of The Harp had more depth than Wrede's first two books of this series. Interesting interaction among the characters who were more developed than previous players. In fact, it was easy to get caught in a love hate relationship with the stubborn minstrel. This is not the only fantasy I've read where minstrels are given important roles in the medieval settings. They were the newspapers of the day, given most of the population were illiterate. Of course tales retold take on their own personality and often the truth is left far behind. I won't get caught up in today's media, so best leave this subject alone. Extremely predictable. The Lyra books are the kind of books people who don't like fantasy pick on and make fun of. There are always elves, or elvish beings with otherworldly beauty and arrogance out the wing-wah. Then there are some kind of dwarfs, or similar small sturdy creatures. And in the middle of it are humans, who are either perfectly good or so evil they'd sell their grannies to the Anthracite mines for the price of a cup of fantasy coffee-equivalent. Talented writing can get you over th Extremely predictable. The Lyra books are the kind of books people who don't like fantasy pick on and make fun of. There are always elves, or elvish beings with otherworldly beauty and arrogance out the wing-wah. Then there are some kind of dwarfs, or similar small sturdy creatures. And in the middle of it are humans, who are either perfectly good or so evil they'd sell their grannies to the Anthracite mines for the price of a cup of fantasy coffee-equivalent. Emereck is plunged into the middle of politi Emereck the minstrel is traveling with Flindaran, a nobleman masquerading as a mistrel, when he discovers, in an abandoned castle, an ancient, and magical, harp. He would much rather have not found it, because all magic has its price. He has an obligation to bring it to the guild, though, and that means he has to deal with other people's desires surrounding it. Emereck is plunged into the middle of politics he wants no part of, and is going to need to learn very quickly who his real friends and enemies are. Neither the plot nor the worldbuilding are as strong here as in the earlier Lyra novels, but it's still an enjoyable plot that does keep moving, and I like the characters. The narrator does a fine job, too. I had to have read this a while ago (like when I was early teen), but didn't remember much of it. Still a great book. It's been fun reading the Lyra books so close together- see the connections and references that I missed before. Ugh. I really tried to get through this. The first book in the Lyra series is one of my favourites, & I was hoping this would improve. Made it up to a third of the way through, but couldn't take any more & gave up. We keep being flung between various different characters, with no real idea of who they are or what any of them want or why. Which, yeah, great for mystery, but really really hard to care about any characters at all. Even the two main characters are 2 dimensional. One is super Ugh. I really tried to get through this. The first book in the Lyra series is one of my favourites, & I was hoping this would improve. Made it up to a third of the way through, but couldn't take any more & gave up. We keep being flung between various different characters, with no real idea of who they are or what any of them want or why. Which, yeah, great for mystery, but really really hard to care about any characters at all. Even the two main characters are 2 dimensional. One is super dull & one has the impulse control of a small child. We don't even get a sense of where they're going (or were planning on going before getting sidetracked). Why were they travelling with the Trader caravan? Why was Emereck being taken to visit, especially considering the family weren't expecting him? Where were they going after that? I know these things seem like irreverent details, but it gives a sense of how little character motivations are fleshed out when even the main characters are so poorly drawn that we don't even know why they are where they are. And that lack of thought & motivation extends to their role in the plot as well. Somehow they can't go back to the minstrel hall because of POLITICS, even though this has apparently been going on for some time, yet they managed to get from the hall, crossing the land, including passing near the border with the enemy country, & Flindaran is from a region (IDK, are these countries? city states? what? I really have no idea) threatened by these people & somehow they completely missed this on their way there. So either the danger is exaggerated, or they managed to avoid it before so could do so again, with a suitable disguise & cover story. Like, apparently they can't pass through a particular city because it has banned minstrels, but nobody points out the obvious solution of maybe HEY JUST DON'T SAY YOU'RE MINSTRELS - not like you're planning to stay there! Bit of a hassle having to evade detection, but surely worth it when dealing with a dangerous & powerful magical object. But no there might possibly be some sort of obstacles that we should avoid so lets not bother & just chill in this castle full of spoiled brats in a land that is slightly impoverished. No way that can go wrong. I've seen reviews excusing the flaws of this book as being down to this being one of the author's earlier books, but that doesn't make any sense considering that Shadow Magic has excellent characters who have personalities & motivation, great worldbuilding, & a plot. And yes I know it got rewritten, but that's irrelevant. The rewrite just tightened up some of the dialogue & exposition, but the book itself had all those things in the original version. It's one of my all time favourites & has been for 16 years, rereading often. Daughter of Witches was merely OK & had a fairly dull plot, but the characters were interesting & I wanted to read on to see how they did. And I was intrigued by the culture & beliefs of Drinn. This is the third book I've read in the series. I'm still waiting to find one that lives up to the recommendations. This one had a more clever plot than the first two, so I added a star. The romance proceeded so subtly that the conclusion didn't ring true. One irritating feature was the jarring transitions between points of view. It takes more than a paragraph break to make these transitions work. I like that the stories of Lyra are building on each other so that the world grows more dimensional with each one. Like the others this one is well paced with lots of action and interesting enough characters. Except for Tarelith. The character I despise most in stories is the one who is both arrogant and ignorant. They run around the story making really bad decisions, yelling at everyone that they're right and blaming people for making good decisions or for having to do something in reaction to I like that the stories of Lyra are building on each other so that the world grows more dimensional with each one. Like the others this one is well paced with lots of action and interesting enough characters. Except for Tarelith. The character I despise most in stories is the one who is both arrogant and ignorant. They run around the story making really bad decisions, yelling at everyone that they're right and blaming people for making good decisions or for having to do something in reaction to those bad decisions. That's Tarelith and it's infuriating which makes the story not much fun at all. This is the third book in the Lyra Series and you can read each book separately so far no past characters have appeared. I liked the book I love Cilhar characters and the introductions to an endangered dying race. You finally get more history on the Shadow Born and about the third moon being destroyed. There was one major plot error but I can't explain it without spoilers. there are deaths and one that should have been climatic was not. the most important one was well made. I like how this author This is the third book in the Lyra Series and you can read each book separately so far no past characters have appeared. there are deaths and one that should have been climatic was not. the most important one was well made. I like how this author handles romance in the book, it's very much a minor detail, they are aware of their feelings but they never even admit to themselves that they are in love. it's amusing to see such a different approach to writing romance in a book. Emereck is a minstrel and his friend Flindaran is a son of a duke. Together they stumble upon an enchanted castle with a power magical object, the Harp of Imach Thyssel. The Harp has the power to destroy cities and shape the world, and the consequences for the person who plays it is vast. Can their friendship survive? Why I started it: I'm working my way thru this series... along with the other 500 series that I'm reading. Why I finished it: I liked that Emereck was so cautious. I know that I woul Emereck is a minstrel and his friend Flindaran is a son of a duke. Together they stumble upon an enchanted castle with a power magical object, the Harp of Imach Thyssel. The Harp has the power to destroy cities and shape the world, and the consequences for the person who plays it is vast. Can their friendship survive? This book was better than the previous two. I still feel as though the way she is writing for this series kind of detaches the reader from the story and the characters aren't as well rounded as in some of her other books, but it was fun and interesting. I found it hard to believe that everyone knew about this age old artifact that hadn't been seen for thousands of years...must be the skeptic in me. This was my second favorite of the Lyra books. I liked how the characters' interactions with the harp seemed to shape and change them, and what they found out about that at the end. I also really liked some of the descriptions, and while I really liked the sister who tagged along at the end, I felt like she needed a bit more fleshing out as a character. Overall this was a fun fantasy adventure with a bit of an illustration about power corrupting. This is not the most engaging or exciting of Wrede's books but it's still well written. Wrede creates lawless and effortless prose and completely original characters and puts them in a unique and well crafted worlds. I loved the hero Emereck for his lack of heroism- he was perfectly believable and flawed and while he did save the day he could not have done so without help from some of the braver characters. By no means was this her best book, or even the best in the Lyra series. There were parts that felt really clumsy, which is something I've only felt in Wrede's work during this book and Caught in Crystal. Still, it was quite enjoyable, and I really liked the excerpt from the "history book" at the end, which was quite interesting and helped to explain a lot of things. Characters: great, storyline: awesome,.....ending? Rushed. The story was great, if a little slow paced up until the last few chapters when the ending was resolved almost immediately. It was just a bit awkward. Also, apparently, all of Lyra's main characters have the same exact conflict and mental processes: "magic/past??? I want nothing to do with it!!! No no no!!!!" For the ladies and "Woe is me, I aim above my station, but I shall protect her with my life if possible!!" For the gentlemen. More of a 3.5 than a 4. Enjoyable, with likeable enough characters and unobtrusive prose, but a little shallow, with a pretty standard-feeling fantasy plot structure. Follows a lot of the author's usual patterns for this universe and doesn't seem particularly unique taken as a whole with the other Lyra novels. I think that this is my second favorite book by Wrede, after The Seven Towers. There is sufficient character development to be engaging, a small bit of humor, a good bit of intrigue, and a decent happy-ish ending. The characterization is a little sketchy, and some of the emotional reactions seem a little shallow, but the story is pretty good. I think the story is actually bigger than the constraints of early-80s short-n-sweet fantasy really allowed, and I kind of wish there were an expanded version. Reread again recently, from my bookshelf. And the book was so fragile with the cover coming off. But again, an oldie but goodie, with a good storyline that flows from other standalone books in the Lyra series. I liked this better than the first two Lyra books, but still on the fence. It helped that there was a bit more focus on a single character's POV, I think - made it easier to connect with the story. I don't really buy some of the reveals at the ending, but overall it was a pretty good book and a solid addition to the worldbuilding/meta-plot of Lyra. I liked the male point of view in this one, and also Liana's character was a pleasant surprise. Some of the twists and turns in the plotline I was unprepared for, but they worked. A beautiful novel, filled with magic, battle, adventure, loss, and romance. I highly recommend this book for those who love good fantasy novels. Favorite so far of the series. Very enjoyable, full of surprising plot twists, the bad guys were well-developed. Enjoyed the world-building. Became somewhat invested in the main characters. I enjoyed this further installment in the Lyra series a good deal, though the ending was quite sudden. This one was better than the first two. Probably because it had the Background filled in in by them. But I found it better imagined especially the castle of wind song. This is book 3 in Lyra series, and every time it's getting more engaging. I finished this one in two days. Once again, a predictable ending, but otherwise a thoroughly enjoyable YA book. I loved the music aspect most of all, although the plot-line continuance of Shadow-Born was also quite interesting.